How to Soft Boil Eggs | Eat This! Making hard boiled eggs is simple, but most people don’t know how to soft boil eggs. For soft boiled eggs, timing is everything. Here’s how to soft boil eggs in five easy steps. 1. Fill a pot with water high enough to cover the eggs by about one inch (but don’t put the eggs in the pot yet). 2. 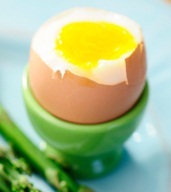 Bring the water to a boil over high heat and then use a spoon to softly place the eggs into the boiling water. Be careful not to drop them in because they may crack. 3. Decrease the heat to a rapid simmer. Allow the eggs to boil for 2 minutes and then rotate them. Let them cook for another 3 minutes at a boil. 4. Remove the eggs from the water and place them into a colander or another container that can be used to rinse the eggs. Run the eggs under cold water for 60 seconds. 5. Use a spoon to crack open the egg, but be careful when cracking it because the yolk will still be runny. So, it is a good idea to open it over a plate or bowl. Peel it, season if desired, and eat. You will know when you have a perfect soft boiled egg because the whites will be cooked and almost custard-like and the yolk will still be runny, making it a delicious breakfast similar to a fried egg but without the added grease.